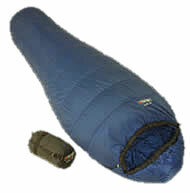 Vango says:"he benchmark compact, light, synthetic sleeping bag in the market place. They are ideal for the backpacker, mountain marathon competitor, cyclist or traveller who requires a product designed for their lightweight and compact requirements"
Pack Size: 32cm Long x 15cm Diameter# Polair RSN outer fabric tough ripstop, hardwearing, fibre proof. Polair Silky inner fabric soft, perspiration wicking, comfortable washable. Insulite Micro filling pedigree component insulation, guaranteed warmth. Omega construction creates more heat retention and better fit. Double offset construction (top layer) provides additional heat retention. 4 strap compression sac further reduces the pack size. 2-way YKK Autolock zip facilitates ventilation at the top and bottom of bag. Insulated zip baffles eliminates heat loss. IFTH Tested provides guaranteed performance. Filled cord sleeve improves comfort around chest and head. In line with the industry standard Vango describe the Ultralite 700 sleeping bag as a '2 season' bag - presumably meaning Spring and Summer. I tested this bag on a camping trip to the Lake District in June 2003 and found it wanting. Despite the temperature only dropping to 10�C or so I was simply too cold - being forced to don t-shirts and on the 2nd night a fleece and pair of tracksters. Also, the zip baffles had a (very) annoying habit of getting caught in the zip - and then wouldn't budge. Having said that, it is very lightweight and would be ideal for back-packing in countries where the night time temperature remains warm. You could use it in Britain if you are prepared to wear all your clothes at night - you just better hope they are not wet. The bag is thin and effortlessly compresses down into a well designed bag with zip lock straps that can be easily stowed in a rucksack.